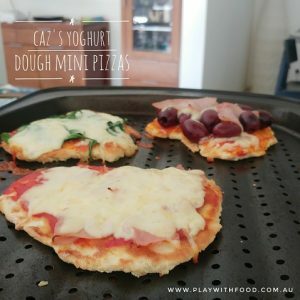 “We are making these yoghurt dough pizzas soon” is exactly what you will be thinking as you read through this blog post. 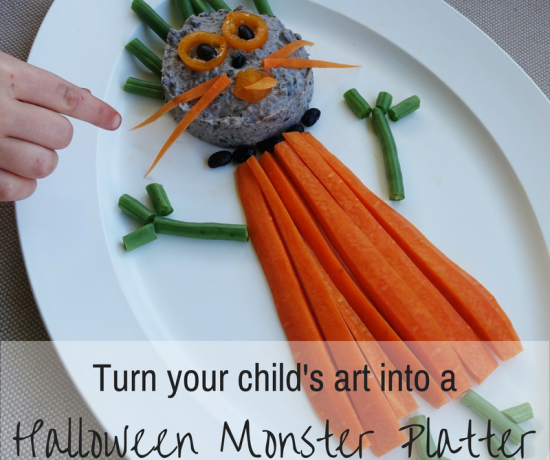 This is a great starter meal for kids to make as they wade their way into making main meals with you. As I will always attest, I know it is easier to get kids to help with baking sweet treats BUT there are so many more exposures to what are “typically more difficult foods” for fussy kids when they are involved in making savoury dishes. Getting kids involved in learning about main meals, like these mini yoghurt dough pizzas, can be just as fun as baking cookies or muffins. I have tonnes of personal experience to cement my argument for doing dinner prep with kids. This includes some of these video posts of us making sushi, Brazilian beef rolls, Peruvian lomo saltado and beef goulash in bread roll bowls with my children on Facebook Live in 2016 when they were 4.5 and 2.5 years old. Just to reiterate … I broadcast these crazy antics LIVE. They aren’t polished, flawless or holier-than-though – I am showing you the reality of having kids in the kitchen trying my patience at 5:30pm during the week. It is by no means easy. But if you set-up well, plan it out and have some good conversations these exposures all start to count. One of my favourite sayings is to “Embrace The Mess” of being around kids and food. And, I’m far from the only person saying this. I love this study that shows how children that are able to get messy with food (ie parents aren’t fussing over them and cleaning-them-up mid-play) shows how open they are to interacting with their meals afterwards. And the embracing mess, starts right from the beginning! The less fuss we make about the mess and turn our attention to role modelling interacting with food and getting on with our own eating, the more intrinsic motivation kids will have to learn about foods. Don’t get me wrong. Too much mess, can be hard to handle! This is especially if we find some safety risks start coming into play. So, my tip is to find recipes that you can make with kids within your comfort range. If you have read my fish and potato croquettes recipe, you will realize why making the croquettes with pre-steamed fish came about after a difficult-to-manage raw fish crumbing experience with my (then) 18mth-old. She managed to fully monopolize on the microsecond lapse in my attention to run a full fillet of raw fish down her tongue. Ok not exactly a major food safety risk, but still a bit cringy. Maybe start with recipes that are inherently “low risk” like; combining the yoghurt and flour in this youghurt dough pizza recipe, patting down rice onto nori to make sushi, popping broad beans out of their shells or stirring Parmesan cheese, olive oil and chopped parsley into boiled pasta. It’s also good to have kids “help” in the kitchen by being near you but out of the way during tasks that may be a bit above them. For example, when I am using the big knife to chop some pumpkin, I don’t need little fingers in the way, so, I would start a meal off by peeling a carrot and then having the kids like the peels up in size order whilst I am doing the pumpkin. This is obviously not speeding up my end product BUT the exposures to the sounds, smells and carrot are still there. Tip: Jot down all sorts of “non-helpful help” that you would feel comfortable having your kids do in the kitchen while you are in there. Think about all the sensory exposures and learning they still undertake by being involved without stressing you out! When you have a great idea for getting your kids involved, make sure it is set-up so you can all be successful and less stressed. As pictured, I had a few options for topping our pizza and we all chose our own. My youngest loves olives! We also had baby spinach and as per the recipe we provided ham. What would your family choose for their yoghurt dough pizzas? A simple dough with so many ways to turn these into pizzas. Your choice of toppings are only limited by your imagination! You can use the pan fried dough as a flatbread on it's own, mix flavours into the dough (like crushed garlic / dry thyme) OR you can make dessert pizza too with some cinnamon or vanilla essence added to the bases. I've even used yoghurt dough wrapped around a slice of banana and a chocolate button, dipped in cinnamon and baked for a fun "pocket cookie". **Note** You can start to add wholemeal SR flour to the mix too and decrease the ratio of white: wholemeal / spelt flour to suit your family's preference) - For those not familiar with self raising flour - it is a flour with the rising agents already added to it. Instead, you can add baking powder to standard flour. Mix the flour and yoghurt together in a bowl so that you make a dough. Use extra flour on a flat surface to roll golf ball size dough balls into pizza bases. In a lightly oiled pan, cook the pizza bases on each side. Add your toppings to the pizzas and grill for 2-3 minutes until the cheese is bubbling. What else is on the blog with only 5 ingredients? Great question. I am glad you asked. 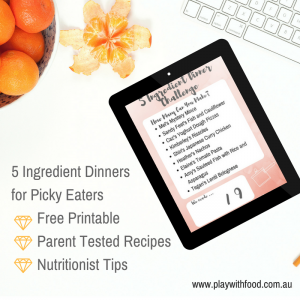 This is part of the 5 ingredients dinner challenge series on the blog, tailored to fussy eaters. I am adding a range of nutritionist tips to quick mid-week meals that you all gave to me (via Facebook or Instagram). Thanks again for all the inspiration! And if you want to play along – get your free checklist here and check out all of the other recipes in the challenge. As always, my recipes include nutritionist tips on “HOW TO” and extend past simply providing you with a recipe and sending you on your merry way. I chat about different aspects of fussy eating and serving these meals to your family. Don’t miss a thing by signing up to my email news below.